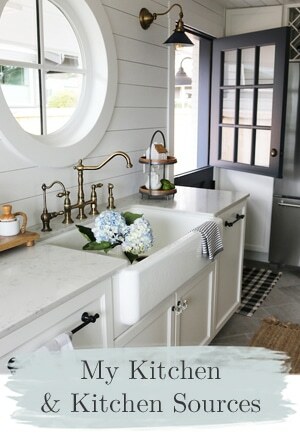 I have had quite a few readers recently ask me about my wood counters in my old house and if they were difficult to take care of. I love that this kitchen was designed before my blogging days, but it still gets a lot of questions I haven’t officially answered in a post! 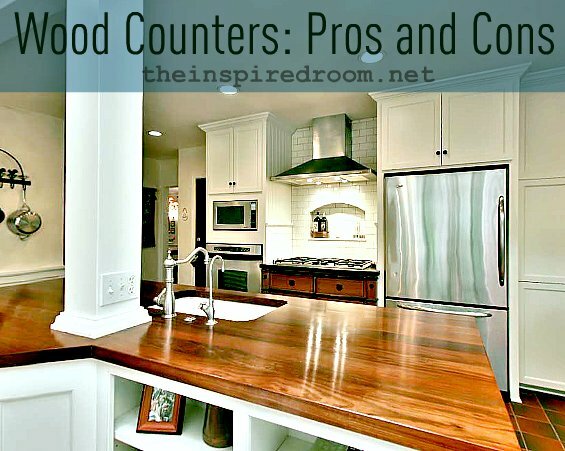 So today, I’m going to finally answer the most common reader questions about my wood counters. 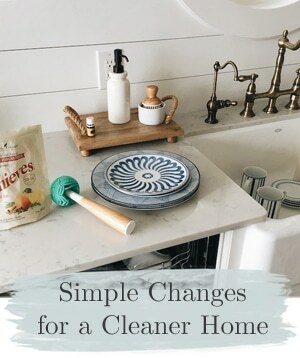 Just like I did with The Truth About White Slipcovers post or How I Keep my Stainless Steel Appliances Clean, or Do I Have a Maid (and other questions about open shelving), I like to tell you about my own experiences so you can decide for yourself if you think something is too difficult, or worth having in your own home. In other words, I loved my wood counters, like my stainless appliances and white slipcovers and even my open shelving, but they may not be the best choice for everyone. Disclaimer: Not all wood counters will be of the same quality or care level nor will your experience or necessary care be exactly like mine. I’ve never had IKEA butcher block counter tops so I cannot compare them with these. Q. Why did you choose wood instead of a stone counter top like granite? We were trying to get away with only doing what was necessary or gave us the most bang for our buck in our kitchen remodel. We had to do so much out of necessity, we were as mindful as we could be about how to save money by making one choice over another. Our counters HAD to be replaced, that part we knew for certain. We were originally going to use soapstone on our counters and wood for our floors. We really wanted the floors to be wood to balance out the hardness of stone counters. But, when we realized how much it was going to cost us to rip out our brick colored tile to install hardwood, we decided it just wasn’t worth the expense to do the floors at that time. So we kept the existing tile floors and went with wood counters on our island and soapstone just on the counter around our stove. Q. Who made the wood counter and what kind of wood is it? The wood counters were custom made for us on site by our remodeling contractor with wood my husband selected from a lumber place near our home in Portland, Oregon. They were thick slabs of Brazilian Cherry (I can’t remember how thick, maybe an inch and a half or two inches? ), and the planks were probably like four inches wide but glued together to form a smooth gorgeous counter top. Q. Did you stain your counters? They were not stained at all, they were sealed with a few coats of Aqua Spar (a type of marine sealer) and that is it. What you see is its natural color after the sealer is applied. Before the sealer, they looked lighter and less rich. Q. How did you keep them from getting water stains or scratches? One, the sealer is designed to protect the wood as if it was a wood boat in water. That is how good that Aqua Spar stuff is. But secondly, we treated that counter like it was a fine piece of wood furniture or our own child. We caressed it and babied it, kept it clean and dry all day, and didn’t set harmful objects directly on it, and never left water glasses on our counter. You can see in the above picture we used my grandma’s doilies under some of our accessories before doilies for decor became chic again! Ha! There were even a few incidents where we left the filtered water faucet running into an overflowing cup on the counter and that meant water went everywhere. Oops! But still, no harm done. But, before you think we were crazy to have wood counters, we felt it was worth the extra TLC because those counters made us happy every single day. Yes, counters made us happy. They did! They were gorgeous. And a side benefit was our counters were never piled up with dishes or mess because we loved them too much to leave dirty dishes on them!! We kept that kitchen much cleaner than we do our kitchen right now. Hmmmm…. something to think about. Q. You must not have kids. Or teenagers. We had preschool aged boys AND teenagers living or hanging out regularly in our home. Lots of kids at once. Yes, it was a bit risky to have beautiful wood counters like that in a busy family kitchen. Someone could have put a water ring on our counter or scratched them! Oh no! But I knew they were just counters. Had we needed to, we could have sanded and resealed. But, we taught our kids about setting dirty or wet dishes in the sink, dishwasher, or on a place mat rather than directly on the wood. They learned to put dishes away instead piling them up on a counter. Q. What about wood counters and entertaining? If our kids had friends over or we had a party, we didn’t make a big public deal about protecting our precious counter tops. We LIVED in our home, it wasn’t a museum. In other words, we realized we were the only ones who were going to care enough about our counters to keep them clean and free of potential harm. We didn’t want to make everyone feel uncomfortable at our house because we were always in a big panic about our counters. We let people of all ages eat and cook in our kitchen and we didn’t give them a list of rules for how to take care of the counters. At least I don’t remember doing that! HA! If necessary, we just waited until everyone left and then we’d go in and clean up the kitchen our way, no harm done. Q. What about heat marks, food prep and cutting? We didn’t set hot pans on our wood counters. Nor did we put food directly on our counters or use them as a cutting board. Q. What was the long term care like? Did you have to refinish them? One time a couple of years after our kitchen was finished we did reapply the Aqua Spar (after a quick once over with some steel wool) to give it a fresh protective coat of sealer. It was quick and easy and the counter looked just as beautiful after the second treatment as the first. Very simple care. The Aqua Spar is amazing and will protect your counters like they would protect a boat in the water, it is good stuff! Q. Do you recommend wood counters? Yes. The reason I was willing to give my counters so much TLC was that I loved how they looked and felt (literally, I would stroke them all day long because I’m insane like that). So, my advice is always that if you find something beautiful you love that might require a bit more care than something you don’t love as much, go with what you love. If you are at all like me and appreciate beautiful things, taking care of something lovely is not really a burden at all. I’d rather have a house full of things I adore and lovingly care for than a house of safe upholstery and indestructible surfaces that I really dislike, but chose because they hides all dirt and marks. 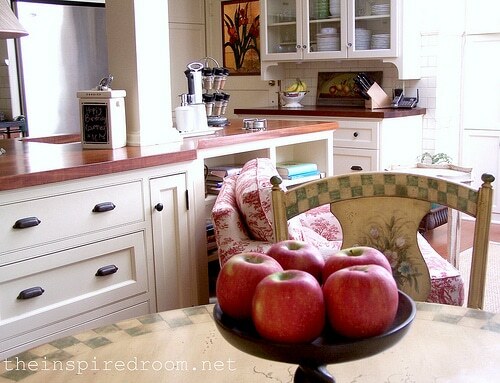 Have you had wood counters in a kitchen before? What are your experiences? I never thought of having wood counters, but the photographs of them are quite beautiful. They look warm and glossy and inviting. I can understand why you loved your wood counters. They were just beautiful! They add such a richness and warmth to the room – just lovely! I think I could live with the extra TLC as you did, because they are just plain worthy of it. Thank you :-) I really enjoyed them! I think design choices are always personal. There is no one size fits all way of thinking! It is fun to learn how others deal with choices so we can make informed choices for ourselves. The counters are gorgeous. But they would NEVER work in our lifestyle – too many young men putting dishes ON the counter instead of IN the sink or dishwasher. Too many messy cooks (ME!!). But it would be nice to aspire to that level of neatness. I’m also in awe that you and my DIL have white slipcovers with small children around. She, like you, just takes them off and throws them in the laundry when they get dirty. Wish I had that gene. I really do better when I have to have those habits I think. I’m a little chaotic in some ways and not obsessively tidy at all. But you’d think so after reading about our slipcovers and wood counters! Some things I seem to care more about than others I guess! Don’t be scared to try it! It makes sense and I know we were probably more cautious than necessary but we just loved keeping them pretty. They were also used a lot so I believe it works even if you are less inclined to give TLC!! I can not find the Aqua Spar on the internet, Can you send me a picture or a web link to the exact product you used. I want to make sure I get a great sealer for my wooden countertops when we put them in. This marine sealer sounds like its exactly what we need. Also another question, Ive read about avoiding heat and coldness on the countertops. Can you use a slow cooker on the countertop? Is that going to discolor the wood? There are many kinds of marine oils and lacquers or varnishes available at any paint store and places like Home Depot paint department…It is often used for more than boats. I had someone replace the bases of my porch columns which were rotting out, and he bought marine lacquer or varnish or whatever it is, at the local Home depot. I did not know this either until I had talked to a couple of contractors and cabinet makers! Decided that for my 1923 California Bungalow counter tops I will do these wood kitchen counters! Love the look! About 1/5 the cost of stone, too! I just had my ancient cabinets repainted and opaque glass inserted and molding elements added. We will use the panels that were removed for cutting boards on this kitchen counter tops. These old cabinets were very thick, made with Douglas Fir. The cutting boards should be fine. Will label them as to where they came from. My dream kitchen has always had wood counters in my mind. Now how do your plank counters compare to butcher block ones? Hmmm I wonder if it was the same idea. Except I usually picture butcher block as narrower strips of wood? Maybe? Good question! Maybe someone will know the answer?! Oh I can imagine!! I love homes that tell stories! This comment brought up a lot of thoughts for me. I think the sweet spot of design is when easy care, good looks and comfort are combined. More to think about and mull over. Beautiful counters! We have a small portion of wood counter in our kitchen. I didn’t choose it since it was here when we moved in, but I have to say that I love it! Our wood counter is really narrow and under a bank of cupboards, so we use it mainly to hold the cake plate full of cookies and a teapot. It doesn’t get “cooking” use. Although our counter isn’t a deep colour like yours, it does help warm up the space and break up a large bank of floor to ceiling cabinets. It also helps to tie in the wood floor and ceiling that are in the rest of the space. 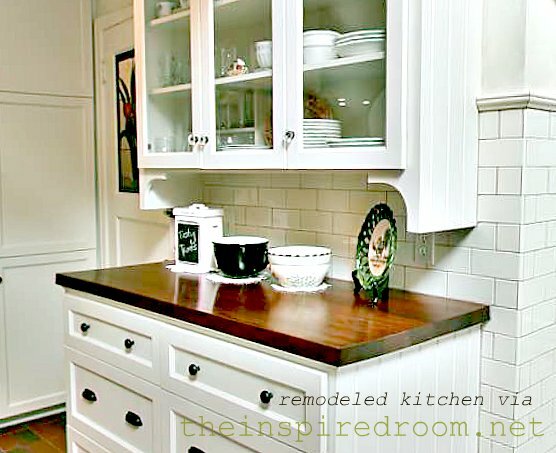 We have put wood countertops in our past 2 kitchens and love them. I couldn’t imagaine anything else. We do give them a little extra care, but that is just a good way to learn to take care of things and keep the kitchen cleaner. We did ours for under $400 using IKEA butcher block. More info on my countertops here! I L.O.V.E. those wood counters! However…I know myself and I would always set stuff on them…so it wouldn’t work for me boo! Thanks for this post…and for helping a girl out before her kitchen remodel. Heh heh, yeah it took a little adjusting for us to learn those habits. Also I should point out that we might have been a little obsessive about them and had we not been as careful our counters might have just had more character which may have been just fine too! 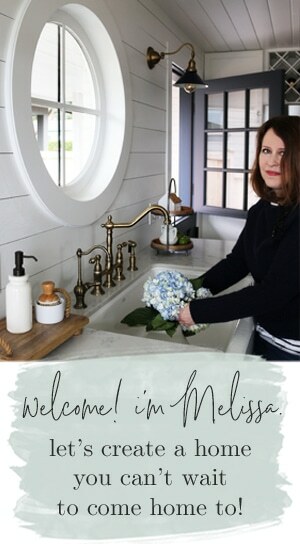 Thank you Melissa, I have always admired wood counter tops, and have thought about them for my home, but I would want to break up the wood with another surface and my kitchen is not conducive for that. Your kitchen was so pretty I can see why you took extra care. You always are so helpful with information that is practical and honest, thank you for that, Have a great week. OH MY GOSH they are FINE!!!! I would LOVE to have them if it were just me and I know they would stay that pretty but just don’t think they would work in my house. They sure are gorgeous! Right now my old Formica counter tops look like a mess with hunks out of the ages and stained up. :( just plain ole ugly. It would even be fun helping build these like yours. I LOVE messing with woodwork. VERY NICE you guys! Hi Melissa, Hope you haven’t answered this in a previous comment, as I don’t have time to read through them all. I was just wondering if the Aqua Spar is safe for foods. We have a butcher block counter from Ikea that we really like. We just oil it once in a while, but I love the look of your counters–so rich! Also, I went and looked at the open shelf post, and I love the rug in your kitchen. Can you tell me where you got it? Hi Marilyn! Thanks so much! I should also have a disclaimer about Aqua Spar as I can’t say for sure about it’s safety but it is labeled a “non-toxic” product. I thought of my counters like a wood table, we didn’t eat or set food directly on the counter. We used plates and cutting boards for food. The rug is Dash & Albert. Love their rugs! I was never so careful with my wood counter tops as you were. BUT, I loved them still. I absolutely loved how they felt and would find myself touching them a lot, too! Mine did get scratched, but that was fine with me. Even without being super careful (didn’t cut on it), we never had a water stain. If you don’t mind, or even like, a “lived in” kitchen, go with the wood! I agree, yes! I think character is wonderful so no matter what end of the neatness spectrum you are on, if you can handle character, wood (or marble or soapstone!) is lovely!!! I’m curious, too, about the Aqua Spar being food safe? Those are some gorgeous counters! The Mister and I are planning to eventually build a house (sometime in the hopefully-not-too-distant-future? ), and I like to think about all the little bits and pieces we might want to include. Wood counter tops vs. stone or formica (or maybe enamel) are something I’ve mulled over a few times. So, I really appreciate the in depth review. 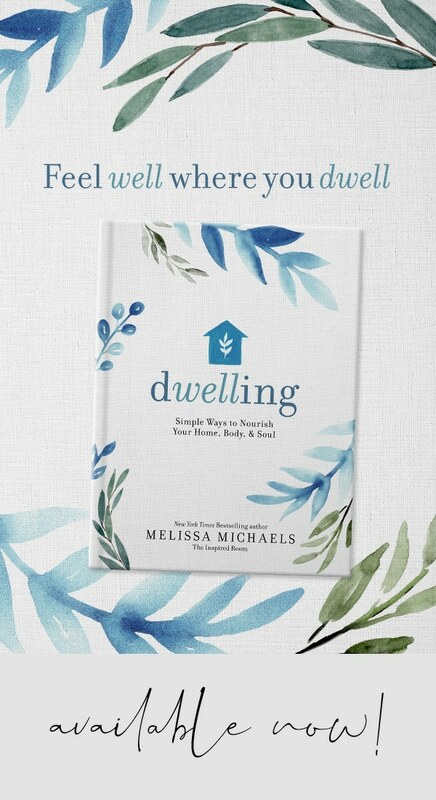 Oh, there are so many beautiful small things to think about when designing a house’s interior! Yours is so beautiful. Thanks for the post! We have Ikea Butcher Block wood countertops. We had them installed when we redid our kitchen in 2008. After almost 4 years I still LOVE them. It brings such a warmth and coziness to our kitchen. We are planning to move this summer. My wooden countertops will be the one thing I miss the most. We had wood counters in our last home and I loved them. They were a butcher block style with a nice fat edge. We choose to use wood from the Myrtle wood tree, right here in Oregon. They were so beautiful. We went with the unsealed, Danish finish versus the marine finish. They were never any trouble. We used cutting boards, didn’t set wet or hot dishes directly on them and never had a problem. I wiped them down cleanser, but dried them when I was done and re-conditioned them, with olive oil about once a week. Loved this post! We, too, are trying to narrow down our remodeling choices to what we can afford, have time to install & “get the most bang for the buck.” Also, any countertop material requires some care and things to avoid! I’m so happy to see this post today that I came out of lurkdom to comment! We had the IKEA wood counters (and cabinets too). When we bought our house it had the formica counters witha metal band at the edge. Eventually we decided Ikea was all we could afford and went with that. My husband was very leery of wood counters, but I finally convinced him. I used mineral oil on mine and was very happy with them. Before we used them, I made sure to give them several liberal treatments and did it every 6-8 weeks after that. Other than that I did nothing special with the counters. We had a 2 and 4 year old and we never experoenced any issues at all. When we sold out house, I was asked by a realtor why we had chosed the wood, and I told him the truth. I liked it. Your wood counters are lovely! I’ve been seeing a lot of them lately, and I’ve been quite impressed! From your description, it sounds like your wood counters didn’t take much more care than my laminate counters do (no cutting, no hot foods, etc.) My dream counter top material is soapstone, but if I ever remodel or build a kitchen, we’d probably go with concrete. Cheap, durable, and surprisingly beautiful! That wood is absolutely gorgeous!! Love that cherry. We have had wooden countertops for a number of years (made from 12 inch wide pine boards) and I love it, and we abuse it! (to some degree). No matter what kind of countertop I have had, I never sit anything hot on it nor do I cut directly on it…so wood has not required any change in that thinking. But we do sit dishes (not hot ones) and wet things on it all the time. We have lived with it from toddler kid years right up through a zillion teenagers hanging out here. It still looks great except for one small section between the dishwasher and the sink that gets very wet (and stays that way alot) Will probably redo that this summer. So I really think that wood, when properly sealed, can hold up to more abuse than we think. You are probably very right. Especially when you consider that the character of wood being used over time is sometimes part of its charm. While we took care of our counters maybe more than was really necessary, we also had so many kids and people in our kitchen all the time who were using those counters, and that I think that fact alone shows how durable my counter was! I love the look of wood! Your counter tops are timeless and classic! I am SOOOO tired of granite! Thanks for sharing! BEAUTIFUL! Thank you for the wonderful post. My husband and I are looking at countertops as we speak (we are currently-temporarily using plywood covered with oil cloth as countertops). Rennovations make us do the wildest things. I love the wood countertops. I’ve been wanting to replace mine with wood. Those in your old kitchen are just beautiful. Your counters are beautiful but I was drawn to your table. Did you paint it yourself? I have a kitchen table in desperate need of a facelift. Thanks! Your kitchen is just lovely and I have to say the countertops are my favorite feature! They just say “homey” in a way that no other material can. I’ve lived in little Manhattan apartments for nearly 7 years, so ANY countertop is a luxury! Thus far, I haven’t had one that I could remodel but if/when I do, wood would be high on the list of possible countertop contenders. I would have been really difficult for me to leave that kitchen. If I had the opportunity, I would have wood counter tops. I don’t have too many things in my home that take extra care. The beauty of that wood is something I would be okay with spending extra care on. But, right now we have 1959 worn out sparkle laminate. I don’t mind a wood counter top for the bar.. but prefer a sturdier granite for the main counter tops. And I love to do cutouts like your arched alcove over the stove.. makes the house unique. 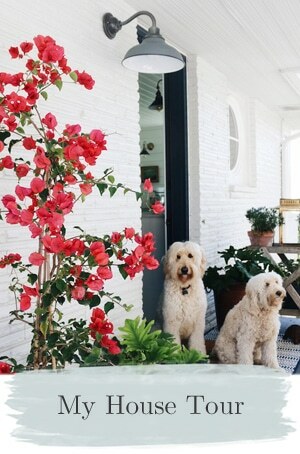 I’m with you….just like marble, I would put the love into these because they would make me so happy! 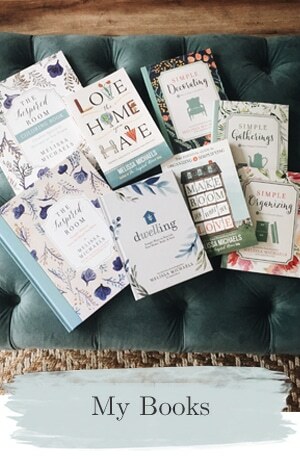 Hi – I loved this all so much that I just did my kitchen countertops in a very similar fashion. We have kids, pets, and a high traffic kitchen – I hope I can care for them as well as you did! Now that they are done….how do I clean/sanitize them without ruining the varnish? I know that you posted this a few years ago, but if you do happen to read this, would you mind sharing what place in Portland you bought the wood from and what the approx. cost per square foot was (if you remember!)? I live in Portland, OR and am in the market! I want dark stained butcher block or wood countertops too but for my laundry room. I want white cabinets… I think it’s just gorgeous. I’ve been pricing out the size I need though. It cost more than the granite did for my kitchen! I am thinking of going with the cheapest wood (probably maple or oak) and staining myself. I appreciate the sealer you told us about. I plan to look for that and use that. I guess my issue is I need a 12′ long piece by 39-42″ (depth of full size washer/dryer). I plan to have my contractor router the edges if he will… I just think granite is over-done and also I have granite in the kitchen and like it but I want something warmer, homier and different. If it costs less, I’ll be very happy! I would love to stain and seal it myself. I love doing that sort of thing. I hope my contractor lets me do it. I absolutely love your counters. I have convinced my husband to allow me to redo our countertops and I want to use wood. Do you know how the countertop was attached to the cabinets? We are thinking about wood for our island and would also have a sink like yours. How has the wood held up around your sink area? Does that area require extra care and maintenance? Three weeks after installing the most beautiful sealed wooden countertop, one of my in-laws put a dip bowl straight from the microwave onto the counter. I now have a cloudy ring and cry whenever I see it. I’m trying to decide whether I should try to restore it or give up and put quartz instead. All it takes is one inconsiderate person. I love the look of worn counters! I would get antsy if they were perfect and shiny. So I’m assuming the spar finish is not the one I want? I put a spar finish on my bar counter top and have left water on it it didn’t do anything…no marks, nada. I wonder what the difference in the two “spars” is. Thanks for this! Most people give me “that look” when I tell them I am going with butcher block kitchen counters!